This is unbelievable, what a fantastic idea, it is gorgeous. The new Mom is going to love, love this! WOW! This is incredible! What a fabulous idea! She’s going to love it! Ahhhhh!! I LOVE that! Sooo cute! Oh my gosh!! This is absolutely adorable. Your cleverness and ingenuity are just mind boggling. Love it, love it! this is SO cute! how talented and clever you are! your gift is going to steal the show @ the shower! Holy smokes…I’m just as much in awe of yours as I was of Lauren’s. Amazing. You are so creative and clever – who would have thought. And this is why, once again, you deserve that artisan award. WOW!!! That is all I can say!!! You are amazing! It is no wonder SU thinks so too!!! Great work!! I love it!!! OH my- this is absolutely stunning!! WOW! This just knocked my socks off! You never cease to amaze me! Those flowers look so real in that setting, can’t believe they are Primas! You rock, gf! Awesome, what a fantastic idea and a fabulous gift!! Oh my gosh, that is the cutest thing EVER! I love it. I bought a ton of those tins from Target too…now I know what to do with them! I also loved your favorite things idea you did with it. You are amazing!!!!!!!!!!! Wow, this is beautiful. I’d have a difficult time giving it away too. Simply stunning! This is adorable. I don’t know if I could give it away either. She will love it. Wowza!! I love how you took an idea and totally made it your own. GREAT JOB!! WOW!!!!! What a fantastic gift. I loved Lauren’s onsie bouquet, and this is just as GORGEOUS! Holy cow!!! This is absolutely amazing. TFS- I would love to try it. This is jaw-droppingly amazing!!! I am in awe! Your “secret” recipient will be ecstatic! Holy Buckets! That is cute. I’ll have to remember that for the next shower that I am invited to attend. Although, I’m not sure that I could replicate it! Just beautiful! This so cute!!!!!!!!!!! and creative. The cards are a great touch. I would like to give it a try sometime. This is so amazing. You are so talented, I would never have thought to do anything like this. OMG! Mary Jo your talent just blows me away! Love it! Oh, Mary Jo, this is fabulous! I couldn’t even imagine making something so wonderful! If the aide knows you make such beautiful things, it won’t be a secret! Amazing work of art! It is absolutelly ADORABLE!!!! I LOVE it! Holey Moley this is incredible. I absolutely love it so I can just imagine the recipients excitement when she sees this. Your talent amazes me. I’ve got to find someone expecting so I can try my hand at this. WOW! This is just amazing. Your momma is just going to adore this! How adorable. Do you have a template for the onesie cards that you can share with us? This is the most amazing gift item I’ve seen thus far!! You really out did yourself on this one. Absolute awesome, creative idea!!! I know whoever gets this is going to love it!! TSMFS. Brilliant! That’s all I have to say! Awesome!!! You are very clever and creative and I love your work! This is AMAZING!!!!! I so love it! I am expecting a little girl this September, abd have 2 girlfriends expecting at the same time. I’ll definately be re-creating this for them! THis is the best! Wow!! That is SO stinkin’ cute! I love it! This is awesome! You should be very proud of yourself. Your work really is over-the-top remarkable. If this isn’t the FINEST gift your co-worker receives for Baby Morgan, then I’d be surprised! BEAUTIFUL!! Oh my gosh, Mary Jo, you never cease to amaze me!!! What an incredible project!!! I can see why you’d be reluctant to let it go… 😉 It looks awesome! Love the matching cards, too! How creative! You have outdone yourself. This is really adorable. Simply adorable…now to Target to see if they still have these tins! Would you consider writing a tutorial? this is a genious idea! I get those “aha” moments while driving too — although nothing this good! It’s a beautiful gift to give to your friend – I hope you made one to keep for yourself too! OMG these are so creative and the bomb!!!! You outdid yourself!!!! This is just the cutest idea! My DIL is expecting so I’ll need to try to create one of these for her. Thanks so much for sharing. If this was for me, I wouldn’t want to take out the onesies! What a charming present. You did a fabulous job – Soooo creative! wow – this is just incredible!! Oh Golly! I almost fell out of my chair when I opened my email and saw this! It’s too adorable and creative for words!! I love, and I know your secret buddy will too :0) Thanks for sharing with all of us!! OMgosh, this is just fantastic!!! 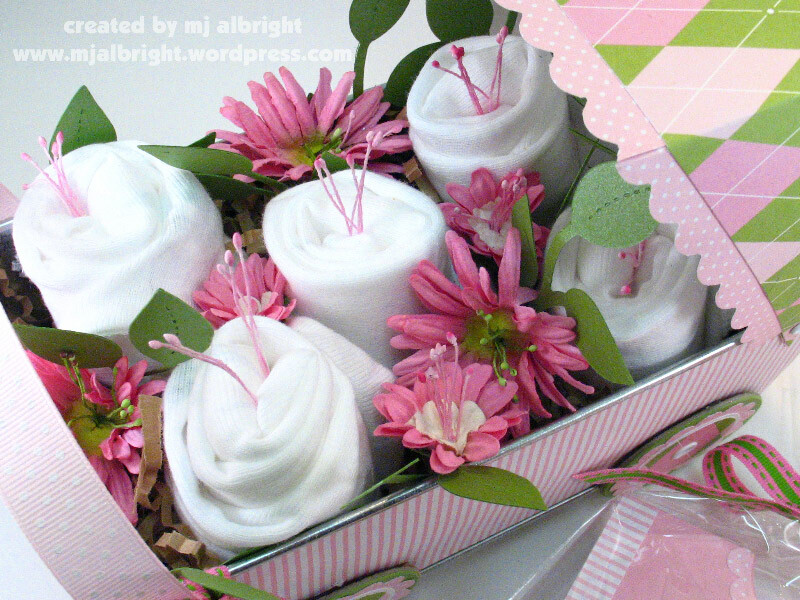 This is the cutest baby gift ever! So creative! Thanks so much for posting this. Oh WOWZA!! That is fabulous!! I am totally in love with it! This is drop dead, to die for, absolutely wonderful! I would expect tears when you give this as a gift!!! This is the most adorable creation! Thanks for the inspiration! Genius, pure genius!!!! Way to go, Mary Jo !!!! Oh for the love of rubbah….. A*M*A*Z*I*N*G – again… 🙂 Now, I do have a question about this being a secret gift….I cannot image anyone else in your office who might be even half this paper-crafting goddess-y… how do you keep a precious, sweet gift like this a ‘secret’? The baby carriage is so beautiful! Wow! Mary Jo, this has to be the most adorable thing I’ve seen in a long time. You are freakin’ Repunsil – spinning everything you touch to gold. I tagged you at http://www.cateredcrop.com. Hope you have time to join in the fun. Unbelievable—that’s all I can say—UNBELIEVABLE! I LOVE it and it’s GOING to be repeated—I promise! THANKS for sharing! That is by far the cutest baby gift I have ever seen!!!! You are so talented!! How special she will feel when she receives her adorable gift. MJ, that’s SO CUTE and I love how you coordinated the tin to the cards! LOVE this!! I have like 5 of those tins and I’ve been scratching my head wondering what in the world I’m going to do with them…but I had to have them because they were cute and they were ONLY a DOLLAR! LOL! All I can say is WOW! Double WOW! This is absolutely GORGEOUS, Mary Jo! HOLY COW, your baby carriage is just adorable. How long did that take to make? I am slowly lift my jaw off the floor. You are so amazing Mary jo and so talented. Thanks for sharing this precious project with all of us! That is just downright adorable, very creative and stunning, you did a Terrific job, she is going to totally Love this!! thanks for sharing this idea…it’s too cute for words! That is one of the cutest altered project I have ever seen..WOW! SHUT UP!!!! This is adorable!!! MJ! This is the bomb!! Just like everything else you make!! Wow, wow, wow!!! What else can I say??? Fantastic job! Wow, this is so cute! You did a great job, I bet she LOVES it!! I love this idea!!!!!!!!!!!!! I have already made one for a family friend. 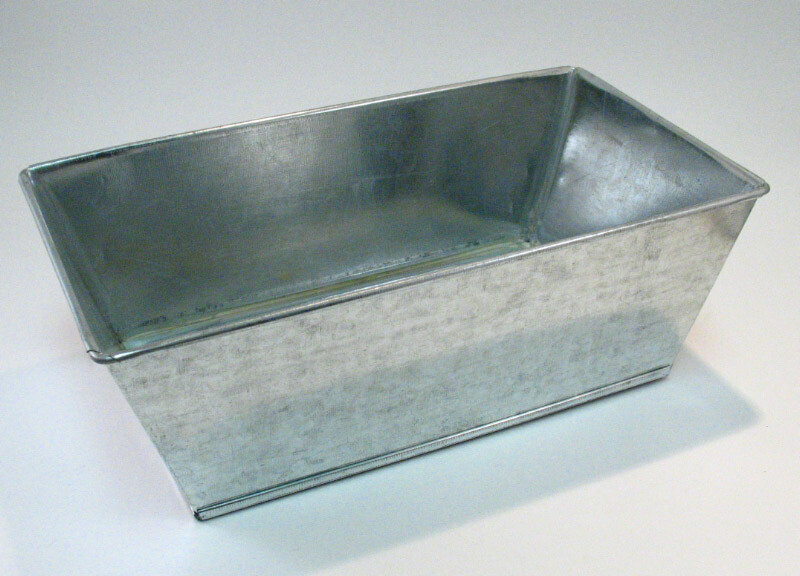 I wasn’t able to find any of those cute tins left at Target or anywhere else for that matter so I bought loaf pans at the dollar store. The worked just great! Thank you so much again for this fabulous idea!!!!!!!!!!! 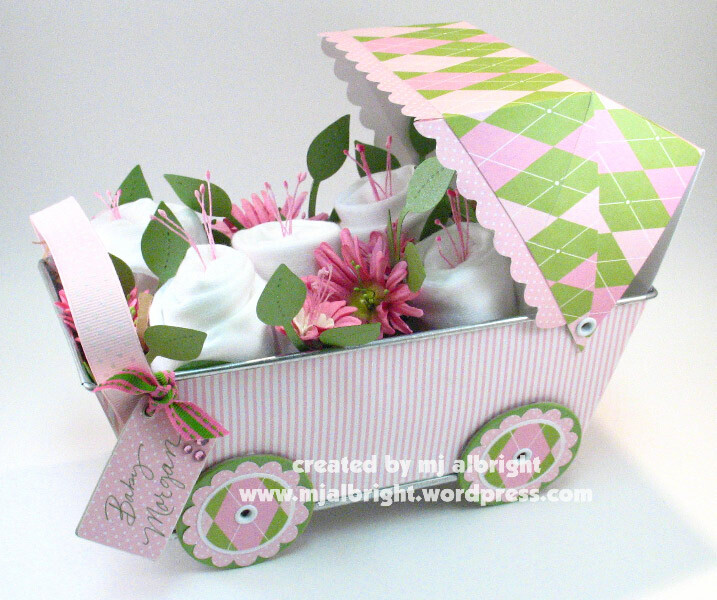 Mary Jo this carriage is too adorable for words, a tutorial was requested and now I wil BEG BEG BEG!! for more instructions too!! I mean this has got to be one of the absolutely cutest projects ever. so ppppppplease won’t you reconsider a help a sister out? thank you for your inspiration! This is absolutely beautiful! What a wonderful gift to receive! THIS IS AMAZING!!!! Now I know what to do with all those tins I collected in the $1 spot!! Awesome work!!! This is beyond cute. I love your work and am completely awed by this project. Lovely! Unbelievable!! It’s great gift to mom.Is it hand made?i love it.thank you so much for the post. Nice gift and it’s looks so beautiful in pink color.i love it.